A Provincial Gazette was issued on Saturday. 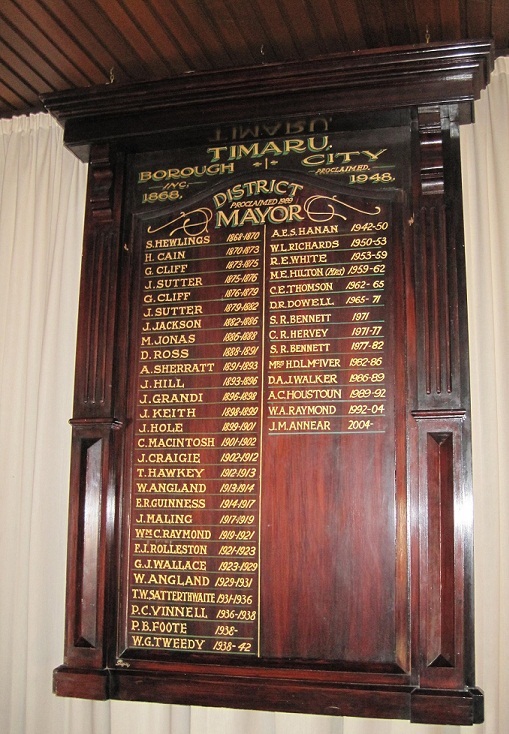 That the following persons have been duly elected as members of the first Municipal Council for Timaru— Richard Turnbull, George Healey, Henry John LeCren, John Inglis, Francis W. Stubbs, Joseph Ellis, Samuel Hewlings (chairman), Duncan McLean, and Frederic LeCren. The Timaru Borough Council, in discussing the Mayor's future salary; which has hitherto been £100 a year, decided that it should be nothing. There are photos of Mayors around the room. Timaru, December 29. Hearty congratulations were extended today to Mr. and Mrs. J. Hole, of Timaru, on the occasion of the diamond jubilee of their wedding, which took place at Wingfield, Wiltshire, England, on December 29, 1875. They came to New Zealand in 1879, and later arrived at Timaru, where they have resided practically ever since. Mr. Hole was Mayor of Timaru from 1896 to 1902, and is the oldest living ex-Mayor. He has been prominently associated with many public bodies, including the Trotting Club, of which he has been president since 1915. 23 Feb. 1938: Timaru mayor Percy Vinnell dies suddenly after 20 months in office. His predecessor, Mr T W Satterthwaite, also died in office. Auckland Star, 23 February 1938, Page 8 SUDDEN END. Timaru, this day. The death has occurred of Mr. Percy Cornelius Vinnell, Mayor of Timaru. It came with startling suddenness. Mr. Vinnell had been in good health, but yesterday afternoon he said he had not been feeling well and spoke of consulting a doctor. Last night, however, he attended a meeting in the Council Chambers. Mr. Vinnell was born at Oxford, England. in 1879, and was educated at St. Paul's School in that town before coming to New Zealand in 1913. He spent two years in Wellington, and then came to Timaru, where he set up in business as a boot manufacturer. He was first elected to the Timaru Borough Council in 1919, and served under three Mayors. He succeeded the late Mr. T. W. Satterthwaite as Mayor in June, 1936. It is a coincidence that his predecessor died under almost similar circumstances. Vinnell twice contested the Timaru seat in the interests of Labour, but was unsuccessful. He enjoyed wide popularity and was universally trusted by all classes of the community. With more than 50 years of public service, Cr Ray Bennett is seeking a further term on the Timaru City Council. New Zealand's longest-serving district councillor, Ray Bennett, of Timaru, hopes to extend his impressive record of 50 years' public service by being re-elected at this year's local body elections. Mr Bennett (78), a retired chartered accountant, was just 24 when first elected as a councillor in 1956. He became mayor in 1971 for a year, when the incumbent, Durham Dowell, retired to Christchurch, and he took over for the rest of the term. Then it was back to being a councillor until he successfully contested the mayoralty in 1977 and again in 1980. He retired from the mayoralty when he became general manager of The Timaru Herald, so had a break from council duties for four years, before being elected back on to council in 1986 and then 1989, following the reorganisation of local government, and he has been there ever since. Mr Bennett always wanted to be a councillor - his grandfather Joseph Shepherd Bennett was a councillor in Timaru from 1885 until 1899 - and he kept standing because of a desire to help people. "The only reason I'm here is to help people and try and interpret what people want. The only reason you've got a mayor and councillors is you can't get 42,000 people in the council chambers. "You've got to try and interpret what people want and what they can afford." To be a good councillor, it took courage, along with sticking up for your ideals and for what you believed was right. "I don't agree with grand-standing or trying to push your own barrow. I've never done that and never will." While he had been very lucky to achieve a record number of terms, he said he never attempted to set a record. Mr Bennett enjoyed his stints as mayor - which he described as "absolutely the cat's whiskers" - and a highlight for the self-confessed royalist was showing Prince Charles around Caroline Bay in 1977. He also enjoyed the team spirit on the council. "You've got to like what you do. If you didn't like it, it would be no good standing for council and getting in. You've got to enjoy it." Describing himself as "Timaru to the back teeth", Mr Bennett was also involved with numerous groups and organisations in the community. "I'm doing as much now as I was doing 50 years ago and loving it. I'm not slowing down, hell no." "I still think young. Age doesn't worry me, I keep going." And, what if he doesn't get re-elected this time? Well, if voters thought other candidates were better suited to the present climate, then he would accept their decision, but he would always be grateful to those who had supported him for so many years. On October 9, Ray Bennett's 50-year career in local government came to an end. Features editor Claire Allison spoke to Timaru's doyen of local government. Ray Bennett always said the voters would tell him when it was time to retire. This month, they told him it was. And while some people worried that it might be a crushing blow for New Zealand's longest-serving councillor, Bennett is nonchalant. "The public have made a decision, and I'm quite happy with that decision. I offer my services, the public pick the best people they can for the time, and that suits me down to the ground." He admits he did debate whether he should stand for re-election, but decided he would stick with his long-held view that the public should tell him when the time had come. "Am I disappointed? If I said I was, I'd be lying to myself. I'm quite happy with the result. Every time you stand – and I've stood for 17 elections – there's always the possibility you might lose. "The important thing in life is to take what's delivered to you, and I'm quite content." The October 9 election saw 19 candidates stand for the seven Timaru ward positions. Just two of the sitting councillors who put their names forward were re-elected. Four – including Bennett – were replaced by newcomers to the council table. It was the most significant change he has seen in his years of local government. But to him it was not altogether surprising. "There was a genuine feeling among the public at large that it was time for a change. What I saw, and perhaps did not expect, was that other than the man who topped the poll [Steve Earnshaw] the other four members of Team Timaru were within 300 votes of each other. Bennett predicts a steep learning curve for the new councillors. "It's not only knowing what's on the agenda, which might be 250 pages, but the inter-relationship between the various components – the district plan, the long-term council community plan, the annual plan, and all melded into the budget. "It will take them some time to assimilate all that and be able to understand where they are going. Council is different to any other animal you'd ever get. "If you try to compare it with a commercial business, it doesn't compare. Decisions often take a long time by reason of public consultation, and significant matters each require consultation. First elected in 1956, Bennett served as a city councillor until he was appointed mayor in 1971, when the encumbent, Durham Dowell, moved to Christchurch. Bennett served a year in that role, then at the next election returned to his council seat, deciding not to stand for mayor. He contested the mayoralty for the first time in 1977, in a three-way race he describes as the best election there had been. "[Eric] Johnston, [Bill] Greenwood and Bennett, we were all sitting councillors, and the three of us would go in one car to all the candidates meetings." And while he was elected, there were some who weren't so sure that the Timaru bachelor was the appropriate choice for the town's mayor. "Somebody wrote to the paper and said `he's not married, he should be married before he stands for mayor'. "I replied I'd do whatever the public of Timaru wanted me to, but maybe marriage was a bit extreme." He contested the mayoralty again in 1980 and was re-elected, but stood down from the position in late 1982 on being appointed general manager of the Timaru Herald. He didn't think it was fair to hold both positions. He returned to the council chamber in 1986, and three years later contested the mayoralty for the newly formed Timaru district, against sitting mayor Dave Walker and Strathallan County chairman Archie Houstoun, who was to win the mayoral seat. Much has changed in the council chambers over the years. "When I first joined council, we had three meetings a month. Committee meetings with no delegated authority from 7pm to 10pm two nights, and the council meeting was 7.30pm to 9.15pm. "In those days, there was no pay at all. It was all voluntary, and I enjoyed every minute of it." There was no pay for councillors until 1965, and even then, it was just 1 per meeting – a total of 3 per month. "With no delegated authority, everything had to go to council. Then we were finding we were starting to make decisions in the committee meetings – important decisions – late at night when everybody wanted to go home. "It was then decided we'd have a bite to eat at 5.30pm, and start the committee meetings at 6pm. One councillor would always come late, a cup of tea in one hand and a sandwich in the other. "Then we started meeting at 4pm, have a break at 6pm, and carry on after tea. "And the same thing happened again. These days it's a different story; the council meets during the day because we had found we were more concerned about making a decision so we could get home to bed, rather than for the benefit of the city or district." The number of councillors is the same now as it was when Bennett began his local government service. "When I started off in Timaru [City], there was a mayor and 10 councillors, then I think it went to a mayor and 12. Then in 1989 [local body amalgamation] we had a mayor and 16 councillors, then it dropped to 12, and now we've got a mayor and 10 again." The difference is, those 10 councillors represent the Timaru district – encompassing Pleasant Point, Temuka and Geraldine - not just the Timaru city area. But it has not all been long meetings and reams of paper. There have been personal highlights, and highlights for the council as a whole. Bennett doesn't have to think long to list some of his; standing in an open paddock in 1959, looking out to the site of the new (Claremont) reservoir when it was agreed to go ahead and do it; meeting the Queen and taking Prince Phillip around Caroline Bay in 1977; going to morning service at Christchurch Cathedral, representing the city, and meeting the Queen Mother; coming down on the navy vessel Canterbury on its maiden voyage from Auckland; flying in the co-pilot's seat of possibly an Andover over the whole of South Canterbury. "Those are enjoyable highlights, and perhaps, in a way, selfish highlights. In some way they perhaps made up for the multitude of hours one spends sometimes on quite boring debate, but then that's part of the job." The royal family features strongly in that list of highlights. Is he a royalist? "Yes, I'm a confirmed royalist, oh yes, most definitely. There's a lot of loose talk about the cost of the royal family sometimes in New Zealand, but I suspect a president would cost a lot more." Three big issues stand out for Bennett's council experience – the debates over the tepid pool, the gasworks, and fluoridation. The tepid pool issue was over location: Maori Park vs West End Park. The people wanted a poll, the council refused and contract papers for construction at Maori Park were signed on the Thursday. On the Saturday, the people voted and expressed their feelings in no uncertain terms. Just three sitting councillors – Bennett included – were returned to the council chambers. The gasworks debate was equally contentious. Was the city council to close it down, or re-build and keep it going? The plant supplied reticulated gas, but only to the old Timaru MED area – bordered by Craigie Ave, North St and Grey Rd. The plant survived to supply Timaru residents for some years to come. "It was a 7.30pm council meeting, and the doors opened at 5pm. By 5.30pm the council chambers were full and so was downstairs. There were two constables downstairs, a sergeant and a constable upstairs." Fluoridation was as contentious then as it still is now. It was in the water supply, but there was a tap at the reservoir where people could collect non-fluoridated water. But the people wanted it taken out, and the council eventually agreed. Bennett sees the big issue for Timaru now as population growth. "We have the infrastructure to handle double the population, but we don't have the population. When we did the Timaru master transportation plan, we believed that by the year 2000 we'd have a population of 45,000 in the city alone, and that hasn't happened. "I don't know the answer to that question. I'd suggest to you that most people seem to be content. It's a city they can get across in eight minutes, go home for lunch without any problem. "It's a lifestyle that people from other parts of New Zealand would relish. But even though the rates are among the lowest in the country, they would be even lower if there were more people to spread the load." Timaru's lifestyle, he says, can't really be imagined by people in other areas. He remembers in the 1990s, when the gangs had a high profile, teasing an Auckland business acquaintance on the phone that he had to end the conversation, because it was time to put the barbed wire up on the gates. "And he believed me." He says that while businesses might be encouraged to come to Timaru if they received preferential rates, he asks why a council would do that. "Why would you do that to people who have been your loyal ratepayers for years; bringing in the competition to erode their business?" Waimate. Mayoralty. G. Dash (re-elected unopposed). The Borough Council was also returned unopposed. The half-holiday is changed from Thursday to Saturday by 415 votes to 289. Only 43 per cent, of the electors voted. The only election for the Waimate County Council was in the Otaio Riding. Mr. H. B. S. Johnstone (chairman), 147 votes, defeated Mr. J. J. Gregan, 105. Timaru. Mayoralty — T. W. Satterthwaite (sitting Mayor), 2956; G. Benstead, 2085; A. M. Paterson, 528; G. T. Koller (Labour), 349. Moss Jonas was born in April 1839 at Brighton, England. At some stage before coming to New Zealand he sold shoes laces on the streets of London. He came to New Zealand in 1860 by the ship Cashmere landing at Port Chalmers. He also spent a few years in Christchurch before shifting to Timaru in 1868 where he started a crockery and furniture business. During his time in Timaru he also owned a Tannery at Saltwater Creek, built a block of shops in Stafford Street, and he built and owned the Theatre Royal in the 1880’s. In May 1871 he married Emma Symondson, who was the daughter of Philip Symondson, of London. Moss and Emma raised a large family. Moss was also the main driving force behind the building of a Jewish Synagogue in Timaru. The foundation stone for this building was laid on the 21 June 1875. During this time he somehow found time to be the President of the Jewish Congregation for a period. As well as being a Justice of the Peace, he was also the Mayor of Timaru at the time of Queen Victoria’s Jubilee (1886-1888), a member of Timaru Borough Council for 17 years, a member of the Harbour Board and also President of South Canterbury Rugby Union. In the 1882 List of Freeholders of New Zealand he owned numerous acres in the Geraldine County as well as land in Timaru. In 1898 Moss and his family went to live in Vancouver, Canada for five years where he had an auction business. He returned to Timaru in 1902 and started up again as a wool and grain broker and auctioneer in George St. Moss died in Timaru on 5 November 1907 and he is buried in the Timaru Cemetery. F J Rolleston, a former mayor of Timaru and chairman of the Timaru Harbour Board, was also attorney-general, minister of justice and minister of defence. James Hutchinson Sutter was born in Aberdeenshire in 1818, and was therefore about eighty-five years of age at the time of his death. He commenced a seafaring life at a very early age, in a ship belonging to one of his relatives. In that employ he made a number of voyages, and obtained his master-mariner's certificate when he was either twenty-one or twenty two years of age. From that time onward for a period of about fifteen years he pursued his profession in various parts of the world, his experiences including voyages to the East Indies, the West Indies, the Straits Settlements, and China. On his last voyages to the East he was in command of a China tea clipper. Finally he became part owner and commander of a vessel engaged in the Greenland whale fishery, and we have heard him say that lie was one of the first to take a steamship into the arctic ice. After several successful voyages to the arctic regions, Captain Sutter determined to abandon a sea life, and to settle in one of the British colonies. He sailed for New Zealand, in 1859. and for about four years was engaged in business in Dunedin and on the Otago goldfields. He came to Timaru in 1863, the town having at that time scarcely commenced its existence, though the capabilities of the locality, its accessible roadstead, and the magnificent adjacent country, were already attracting outside attention, and gave promise of that marvellous development which has since taken place, and to which Captain Sutter contributed in many ways. He made Timaru his home till 1866, when he sold his business and paid a lengthened visit to the Old Country. He returned to New Zealand in 1871, and again carried on business in Timaru for a number of years. He revisited the Old Country in 1887, and was absent for eighteen months or thereabouts. Since Captain Sutter's return he has not taken a prominent part in public affairs, either colonial or local, although it was clear from his conversation that he maintained a keen interest in them but for more than twenty years he had been a good deal in the public eye and had filled many offices with much credit to himself and advantage to those whose interests were more or less in his keeping. He was a member of the House of Representatives for the Gladstone Electoral District in two Parliaments. His politics were moderately Conservative. He did not speak often in the House, and never at much length, but he was invariably listened to with attention, for his great natural shrewdness, his business aptitude, his faculty for picking out the real points of a controversy and his persistence in sticking to them, and the fact that he never rose in his place unless he had really something to say. combined to secure him the respect of all parties. This is the testimony of one who knew him well as a member of the House, and who was often struck by the superiority of such a representative to some members who talked a good deal more, but not so much to the purpose. In matters affecting Timaru or South Canterbury generally, he was invariably active and energetic as a member, and rendered excellent service to the people. Captain Sutter was first returned to Parliament in 1881. .... He was a member of the Harbour Board for nine years, during two of which he was chairman. He always exhibited the greatest faith in the future of the port, confidently foretold the approaching enormous expansion of its trade, and did his utmost to urge on the completion of the breakwater. For thirteen years he was a member of the' Borough Council, and six times was chosen Mayor of Timaru. He exerted himself strenuously on behalf of the waterworks scheme, a public service which should never be forgotten. He was chairman of the Timaru Permanent Building Society for fourteen years and for five years was chairman of the Timaru Cemetery Board. Captain Sutter was one of those who interested themselves m bringing about the lighting of the town by gas, and was chairman of directors of the Gas Company for seventeen years, a position which he held up to the time of his death. He leaves a widow and three sons to mourn their loss. Profile Timaru District / Patsy McKenzie. Timaru : Timaru District Council, 1994. This is a typo in the Auckland Weekly News 26 June 1934. Dr. McAdam was twice Mayor of Oamaru. He died in October 1913. The death of Captain J.F. Crawford, which occurred yesterday, at the great age of 91 years, will be sincerely regretted by all who knew him. Captain Crawford was born in the year 1815 —the year of Waterloo—in Oxfordshire, England. As the son of an admiral and the grandson of an admiral he was entitled to education at Greenwich Hospital, and there he passed with distinction into the Royal Navy, in which he remained till he was 25. Promotion was slow in those days, and he left the navy and took command of a large merchant ship called the Royal Saxon, and traded to India and other Eastern places until the year 1849. At the end of the 40's Captain Crawford came out to Australia, and settled down in Melbourne, where he entered into business as a merchant with a partner, under the title of Crawford and Devlin, and practically made a fortune. During this time his spirit of adventure led him to make explorations, in which he made some valuable discoveries of minerals. He retired from business, and bought sheep and cattle station, but first along period of drought followed by a devastating fire ruined him, and he had to retire from this calling. In 1865 he arrived in Christchurch, where he entered into business for some time. Following that he went to Timaru in 1858, and was lessee of the Government landing service. While there he built the first breakwater. 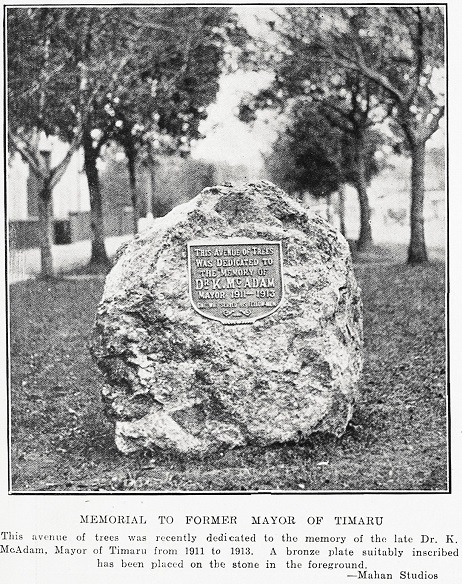 He was Mayor of Timaru [sic: he was the mayor of Oamaru], and in other public capacities helped to found a number of the institutions of the place. In 1872 he went over to Queensland to take charge of a party prospecting for tin and copper, and on completing this work he returned to New Zealand. In 1873 he look over the Allday Bay boating service, which he continued till 1875. After that he was wharf mauler and traffic manager at the Oamaru wharf and in 1879 he entered the railway service, and was station master at Hampden for some time. He took a keen interest in acclimatisation, and both here and elsewhere was a prominent figure in Masonic circles. He was a pleasant and well informed gentleman, who never forgot his traditions, and made no enemies but hosts of friends. Timaru Herald 20 April 1918 Page 8 COUNTY COUNCILLORS ON TOUR. The three days' tour in South Canterbury of representatives from the Waitaki and Waimate County Councils was concluded on Wednesday night, when the Waitaki Councillors reached home after having covered, per motor car, a distance aggregating just a little short of 500 miles. Though the experiences of the travellers were not perhaps quite up to the standard of the records of ancient pioneers they yet learned much in a pleasant way; and perhaps posterity will benefit if the narration of their travels and the information gleaned as a result of them, is put into a great prose poem (all the Councillors seemed quite capable of this), and preserved among the prized records of local bodies. It might be a source of inspiration to Councillors yet unborn, and a valuable guide to the unwary. Judging from the flattering: comments made, not once, but repeatedly, concerning the "fatness" of South Canterbury it would not be surprising if some of the visitors were to transfer their homes to these parts.